Tattoo Blog » Something Fishies Going On. Tattoo Blog » Dislike » Something Fishies Going On. A new tattoo trend is emerging in China, but this particular trend has nothing to do with artwork on human beings. Just incase you’re wondering, it also doesn’t have anything to do with pigs. No, this time the tattooed flesh is that of our underwater friend, the fish. It’s a procedure which would have animal rights groups and law makers in more shall we say, “PC” countries blind with indignant rage, but somehow tattooing fish is just not that big of an issue in China. So what exactly does tattooing fish involve, you ask? Well, it seems that it’s the parrot fish who are the targets of this popular abuse trend. 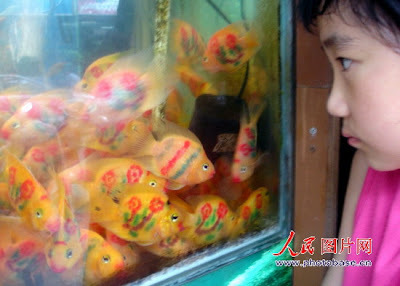 The fish can be bought in sets of four, with each fish having a different Chinese character tattooed on their sides. The meaning of the tattoos range from “may your business boom”, to “good fortune”, “long life”, “luck” and “happiness”. Technically speaking however, this trend isn’t exactly new. It all actually began in 2005, but apparently it’s taken a while to catch on. Ah well…one day when the inevitable gigantic tsunami sweeps tons of water over every last piece of dry land, finally killing off the human race in the process, I guess it will be the fish who get the last laugh. Until then, watch your backs (er…sides), fish. Peace.